MEETING PLACE: Rivers Fiji Office in Pacific Harbour or at your hotel if a transfer is requested. The Upper Navua River is born of natural springs and rainfall in the rugged interior of Viti Levu—Fiji’s big island. After following a meandering path from its headwaters through rolling rainforested highlands, the Upper Navua then descends into an incredibly narrow gorge, slicing a deep chasm into layers of limestone and volcanic sediment. This canyon is one of the most beautiful features in all of Fiji, if not in the South Pacific and the world. Flowing through a gorge that’s over 165 feet deep and in sections only 23 feet wide, the Upper Navua is a “River of Eden.” We’ll ride inflatable rafts through a canyon where sunlight illuminates black volcanic rock walls covered by twisting vines and lush ferns and an astounding number of waterfalls plummeting directly into the river. In other places, the silence is profound, broken only by tiny droplets of water echoing in the natural acoustics of small riverside caves. Best of all, the Upper Navua’s fun Class II-III whitewater makes this incredible canyon accessible to paddlers of all experience levels—even beginners. In 1997 OARS President, George Wendt and longtime OARS friends, Nate and Kelly Bricker founded Rivers Fiji as the first whitewater rafting company in Fiji. Since then, Rivers Fiji has employed local residents to manage day-to-day rafting & sea kayaking operations, and help guide adventurous travelers from around the globe down the Upper Navua River and the ‘Luva River–two of the most beautiful tropical rivers on the planet. 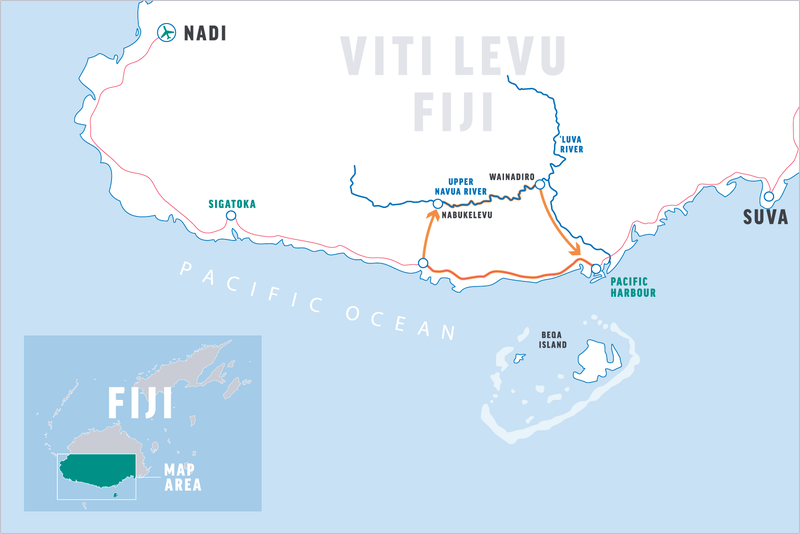 Historically, Fiji’s tourism development has been focused primarily on the coastal communities, with Fiji’s interior populations receiving little benefit. Rivers Fiji, however, provides economic alternatives to people whose previous development options were limited to logging and resource extraction. Friendly, knowledgeable and hospitable Fijian guides make the trips here unlike any other experience OARS offers. Our partner outfitter, Rivers Fiji, Ltd—along with the help of a number of indigenous landowning groups, a logging company, and the Native Land Trust Board—created the Upper Navua Conservation Area in the highlands of Viti Levu. The UNCA is a 17-km conservation corridor that protects the river and 200 meters to either side from future logging and gravel extraction. It maintains the pristine natural state of the Upper Navua River canyon and guarantees natural capital for the indigenous highland residents. We are proud to operate our Upper Navua River trips in the UNCA and a percentage of your trip cost is paid in use fees to 9 land owning families, 2 villages and the Native Land Trust Board. As a destination for a beach vacation, Fiji has few rivals. The ocean water is clear and wonderfully warm, and there are many fine resorts spanning the spectrum from luxury to budget. The snorkeling, diving, surfing and beach lounging possibilities are nothing short of world-class. But if all these activities share one blight, it is their reliance on salty ocean water. The water in the Upper Navua River is gloriously fresh, flowing from highland springs and collected rainwater; a day in the highlands is the perfect reprieve from the salt and crowds on the coast. As you splash through the waves of the fun Class II-III whitewater, we bet you won’t even miss the stinging salt in your eyes. For guests meeting us in Pacific Harbour, the day begins with a meeting time of 6:45 AM at the Rivers Fiji office. We’ll climb aboard our 4-wheel drive highland carrier and head west along the coast with the sun rising behind us. Guests coming from Nadi or the Coral Coast who have arranged a hotel transfer will have a pick-up time from your hotel that varies depending on location. You will meet the 4×4 carrier at the junction of the Queens Highway and the dirt logging road that leads to the river. The drive along the bumpy but scenic logging track ascends steeply to a coastal ridge before winding into the rain-forested interior. After about 40 minutes, we’ll stretch our legs and enjoy a homemade snack. Another 40 minutes in, we arrive at the end of the road. We’ll pack what we need for the day, leaving our dry clothes with the carrier, and begin a short 15-minute hike to the river and where our rafts await. After a safety talk and paddling practice, we’ll head down river. The rapids start right away and we’ll just be hitting our stride when we come to Moce Falls, the biggest drop of the day, just a half-mile downstream. We’ll pass a waterfall around almost every bend as we are carried swiftly along. Come midday, we’ll pull over to a sandy beach for a delicious picnic lunch. Your guides will present an abundant spread of meats, cheeses, veggies and bread with all the fixings, fresh fruit, cookies, and juice. Back on the river, each mile brings more stunning scenery and more fun whitewater. Gradually, the narrow canyon walls fall away and we begin to see signs of civilization. We may encounter a friendly villager aboard a bamboo raft on this stretch of the river as we make our way to the take-out at the village of Wainadiro. Here you will have the opportunity to change into dry clothes for the 1-hour drive back to the Rivers Fiji office in Pacific Harbour, arriving at approximately 5:00 PM. The Rivers Fiji office is located in Pacific Harbour, behind the Mobil service station. Follow the Queens Highway to Pacific Harbour: the station is opposite the ocean side of the highway on Hibiscus Drive. The Rivers Fiji office is inside a gravel drive, to the left of the Mobil station. If you are driving, park your vehicle in the parking lot in front of the Rivers Fiji office. Allow 2.5 hours from the Nadi/Denarau area and 1 hour from Suva. Start with sunscreen, a swimsuit, shorts, and long-sleeved shirt, and then add additional layers if needed. As the day warms up layers can be taken off and stored in your daypack. You may want a jacket or windbreaker if it’s a rainy day as temps can be surprisingly cool on the river. We provide a small waterproof bag on each raft (17” tall x 9” diameter—approximate sealed size) to hold your camera and other items you might need during the day. While these bags are designed to be waterproof, you may wish to place your camera in a zip-lock plastic bag or waterproof casing for additional protection. We also strongly recommend you take out a rider on your homeowner’s policy to cover your camera—especially if it’s fine equipment. If you are planning on bringing a digital camera make sure to bring additional memory cards, batteries, and any other extras you will need. Disposable waterproof and panorama cameras are also a fun option. In order to ensure that each passenger experiences the pristine condition of the river canyon, all of our trips practice a “leave no trace” environmental and social ethic. All garbage and waste packed in are also packed out. We ask that you refrain from smoking while in the raft with other passengers and pack-out cigarette butts. Tipping is optional, but appreciated by our staff. If you are wondering how much to tip, you may consider that we operate in a service industry with a host of behind-the-scenes contributors in addition to the guides on your trip. In general, we suggest a gratuity based on 10 – 15% of the trip cost. It is customary on OARS trips for gratuities to be given to the Trip Leader, who will then distribute appropriately amongst all the guides and support staff. If you plan to tip, remember to bring cash—ATM’s are not readily available.